Appetizers are very common in western cuisine, yet it’s not unusual on Chinese menu. We often have deep fried salt and pepper quails served as an appetizer in Hong Kong restaurants. The quails are crispy with succulent meat inside. When it comes to home cooking, I always turn to my oven simply because I want to use less oil. The other day I baked these delicious quails with my convection oven, that I used to bake crispy pork belly. It’s so handy and quick to get the dish done. You can use regular built-in ovens as well, only with a few minutes longer cooking time though. Rinse the quails and pat dry. Use a pair of scissors to cut each quail into two halves along the backbone. Lightly press and flatten the breastbone. Combine the salt, black pepper, sugar and oil. Evenly rub the salt mixture on both sides of each quail. Set aside for 30 minutes. Preheat the oven (regular or convection) to 200C / 395F. Place the quails on a baking tray. Bake for about 20 to 25 minutes, until cooked through. Cut open a quail’s leg to test, if there’s no pink meat, it’s done. Serve hot with desired salad. 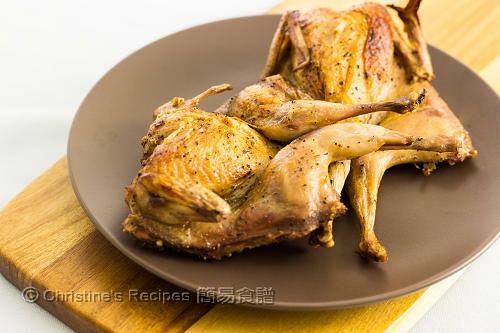 The quails can be marinated and refrigerated one day ahead. When you're ready, remove them from fridge and place at room temperature for about 15 minutes and bake in preheated oven. To get the best results, try to get sea salt. Yet, you can use table salt. You are a great cook, Christine. I would never know how to deal with the quails..and when did I last time have a quail...can't even remember it. 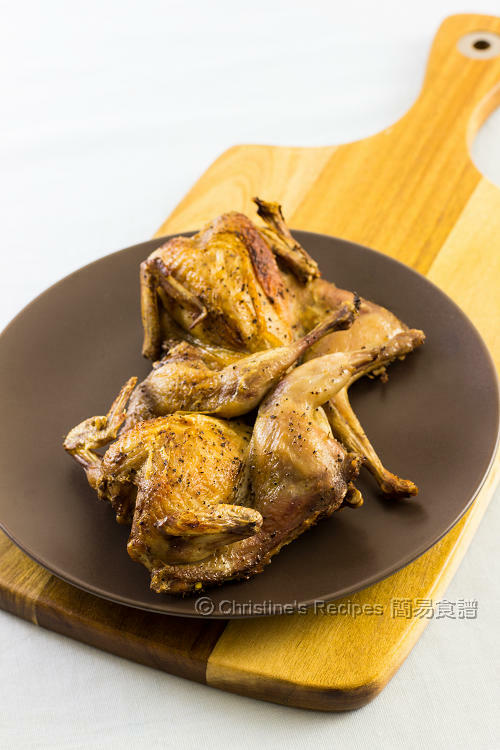 These baked quails look so delicious!